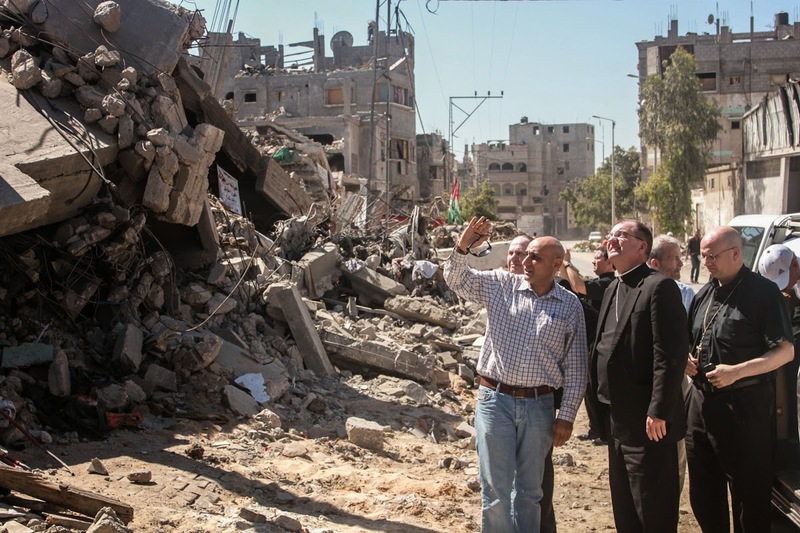 Sixteen bishops from Europe and the US who undertook a fact-finding mission in Gaza have called for an end to Israel’s blockade of the territory and greater efforts to deal with the poverty made worse by last year’s conflict. This was the Holy Land Coordination group’s first visit to Gaza since the violence in 2014 which killed 2,000 Palestinians and 70 Israelis. In a statement at the conclusion of their visit, the delegation which included two Irish bishops called on officials to be creative, to take new approaches, to build bridges, not walls. “We came to pray with and support the Christian community and to promote peace and human dignity in this divided land,” they explained. They said they had witnessed the tragic consequences of the failure of both local and international politicians to advance peace. 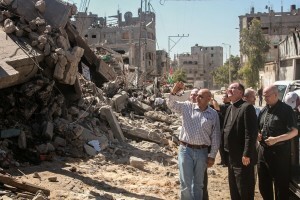 The bishops said many tens of thousands of families in Gaza lack adequate shelter. They related that in the recent freezing weather, at least two infants died of exposure. “The continuing blockade dramatically impedes rebuilding and contributes to desperation that undermines Israelis’ legitimate hope for security. It also creates intolerable levels of unemployment and pushes ordinary people into deeper poverty,” they stated. The episcopal delegation said that despite the devastation, appalling scenes of destruction they saw, and the fears of another war they heard, hope is alive in Gaza. They called on political leaders to defend the human dignity of the people in Gaza. The bishops said that in the coming months they will continue to oppose the building of the proposed wall in the Cremisan Valley, which would result in the loss of the lands and livelihoods of many Christian families. “We must humanise the conflict by fostering more interaction between Israelis and Palestinians. Peace will only come when all parties respect the fact that the Holy Land is sacred to three faiths and home to two peoples,” the bishops stated. They recalled Pope Francis’ recent statement to the Diplomatic Corps in which the Pontiff said his thoughts turn above all to the Middle East, beginning with the beloved land of Jesus which he had the joy of visiting last May, and for whose peace the Church constantly prays. “We did this with extraordinary intensity, together with the then President of Israel, Shimon Peres, and the President of Palestine, Mahmoud Abbas, inspired by a confident hope that negotiations between the two parties will once more resume, for the sake of ending violence and reaching a solution which can enable Palestinians and Israelis alike to live at last in peace within clearly established and internationally recognized borders, thus implementing the ‘two state solution’,” the Pope said. Last Sunday the delegation of bishops was split up when it tried to enter Gaza at the Erez crossing. Despite assurances from the Israeli authorities that the bishops would be allowed to travel into Gaza, only three were initially allowed in, with the others being forced to remain in Israel. However, after waiting eight hours they were eventually let through. Since 1998, the Co-ordination of Episcopal Conferences in Support of the Church of the Holy Land has met at the invitation of the Assembly of Catholic Ordinaries of the Holy Land. Expressly mandated by the Holy See, the Holy Land Co-ordination meets every January in the Holy Land, focusing on prayer, pilgrimage and persuasion with the aim of acting in solidarity with the Christian community as it experiences intense political and social-economic pressure.